Click image to the left to download the pledge form if you would like to mail your donation. The Ethiopian Mission Work began in the early 1960’s. In order to meet the Ethiopian Government requirement of social services, the first deaf school was started in Addis Ababa, Ethiopia. The Uptown church of Christ in San Francisco was one of the major supporters of the mission effort in Ethiopia. Brother Lennie Darden and his wife were partially supported by the Uptown church to serve as missionaries for two years in Ethiopia. During their tenure, Brother Marshall Keeble and two other brothers visited Ethiopia on their way from Nigeria to USA in 1962. While these brothers visited in Ethiopia Brother Darden served as their host. In late 1963 Billy Curl, a graduate of Southwestern Christian College and Abilene Christian University, was secured by the Uptown church of Christ to replace the Dardens when they returned to the USA. In 1964 Billy and his wife Mary entered Addis Ababa, Ethiopia as missionaries fully supported by the Uptown church. This couple served as missionaries in Ethiopia from 1964 to 1970. In 1970 the Uptown congregation decided to develop a program to start a school for young people in the rural area of Ethiopia, along with preaching the gospel of Jesus Christ. To make the designed plan practical, Eromo Kelbisow was brought to the United States to be trained. Eromo attended and graduated from Southwestern Christian College and Pepperdine University. After his graduation in 1976 he returned to Ethiopia to begin a preacher training program. From 1976 to 1987, the Figueroa church, the Crenshaw church and the Santa Monica church of Christ, in the Los Angeles area of California, were heavily involved in the Ethiopia mission work along with the Uptown church of Christ. During those years the church in Ethiopia grew in numbers and quality as a result of the good work done by the mission. The major projects operating at this time were: African Relief Funds, coordinated by Brother R.N. Hogan, minister of the Figueroa church of Christ; Ancha Health Clinic Project, coordinated by Brother Billy Curl, minister of the Crenshaw church of Christ; clothing and grain drive, coordinated by the late James M. Butler of the Uptown church of Christ and brother Joseph Lett of Uptown; and Ethiopian Mission Building Project, coordinated by R.N. Hogan and Calvin Bowers, ministers of the Figueroa church in Los Angeles. The Uptown church of Christ Eldership agreed it was in the best interest of the Ethiopian Mission Work, Hands Across the Sea, to transfer the oversight to the Crenshaw church of Christ Eldership. The Crenshaw church is committed and deeply involved in this worthy program. The Eldership is committed to the Lord’s work in Ethiopia and is dedicated to overseeing the proper and most effective use of all funds contributed by other congregations and individual Christians. Therefore, all congregations and individual Christians throughout the United States are invited to pray and financially support this worthy cause in order to advance the cause of Christ in Ethiopia; also to meet the challenges that are before us. This mission- Hands Across the Sea- has been involved in preaching and teaching the gospel of Christ, distributing Bibles, training church leaders and preachers, and educating young people in two church supported schools in Ethiopia. Many native preachers live on small farms in the rural area of Southern Ethiopia where the local congregations cannot afford to support their own preacher. Therefore, they are dependent on outside support. The Ethiopian Mission – Hands Across the Sea – assists preachers by raising funds from churches of Christ in the United States. At the present time, the mission supports more than forty-six (46) preachers in Ethiopia. Still hundreds of local congregations need preachers and support. Training programs for church leaders, preachers, and Bible teachers at Addis Ababa and Ancha have been designed to help the local congregations in preparing men to serve the local congregations throughout the country of Ethiopia. Ethiopian Mission-Hands Across the Sea- (Locally the Uptown church of Christ Mission) used to have two schools with over 1,000 students with over fifty workers (teachers and support staff including the official workers). At the present time the government of Ethiopia closed one of our schools in Addis Ababa for not meeting the government’s standard. However, our school at Ancha is still open and functioning. Please pray and help us to reopen our closed school in Addis Ababa by meeting the Ethiopian government standards. Shortage of qualified and committed preachers and Bible school teachers. Not having well established Bible school to prepare men to serve in different areas of the local congregations. Schools are losing well qualified and experienced teachers and principals. Competition of other religious organizations. High governmental and community expectations of service. The school facilities have not met the government standards at Ancha. Finishing two unfinished buildings at Ancha in Kambata. Raising more funds to maintain and expand the mission work. Building and operating the Bible training school for preachers. The Ethiopian Mission (Hands Across the Sea) has two primary and two secondary purposes. (1) To fulfill the Great Commission given by Jesus Christ in Matthew 28:19-20 and Mark 16:15-16. This requires preaching the Word of God and helping the people of Ethiopia to obtain salvation for their souls. (2) To train the local preachers and equip them to maintain truthful and factual Bible teaching in the local churches. (1) To assist the saints and others in their physical and social needs Matthew 5:15-16; Galathians 6:9-10. (2) To visit the brethren in every city and village where the gospel has been preached to access their progress. To encourage local congregations to serve the LORD and support evangelism. To establish new congregations in Ethiopia. To build the Bible Training Institute/School. To complete the two unfinished schools in Ancha. To raise sufficient funds to support the mission work in Ethiopia. To train qualified men and place them as leaders in the local congregations. To visit local congregations and encourage them two or three times/year. To prepare preachers and Bible teachers to evangelize in other areas to establish additional congregations. To train at least ten (10) preachers each year in the proposed Bible Training Institute to equip them with sound Biblical teaching. To complete two unfinished buildings in Ancha within the next academic school year. To conduct fundraising campaigns throughout the brotherhood to get more churches and individuals involved in this mission work on a continuous basis. To conduct leadership seminars, workshops, and training sessions so that God’s people will be led scripturally. Establish a mission ministry under the leadership of the Crenshaw church of Christ. Letters, flyers, pledge cards, and brochures need to be set-up and printed. Potential donors/contacts such as local congregations and individual Christians’ names, mailing and e-mail addresses along with telephone numbers will be identified and listed. Printed materials shall be sent with a cover letter to all prospective donors. Fundraising events shall be coordinated and conducted throughout the brotherhood. 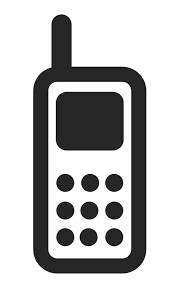 Follow-up telephone calls and personal contact will be on going. Existing and potential supporters of the Ethiopian mission work will be provided with mission field reports and a timely basis. Mission field trips will be organized and orientations will be given prior to any particular visit. 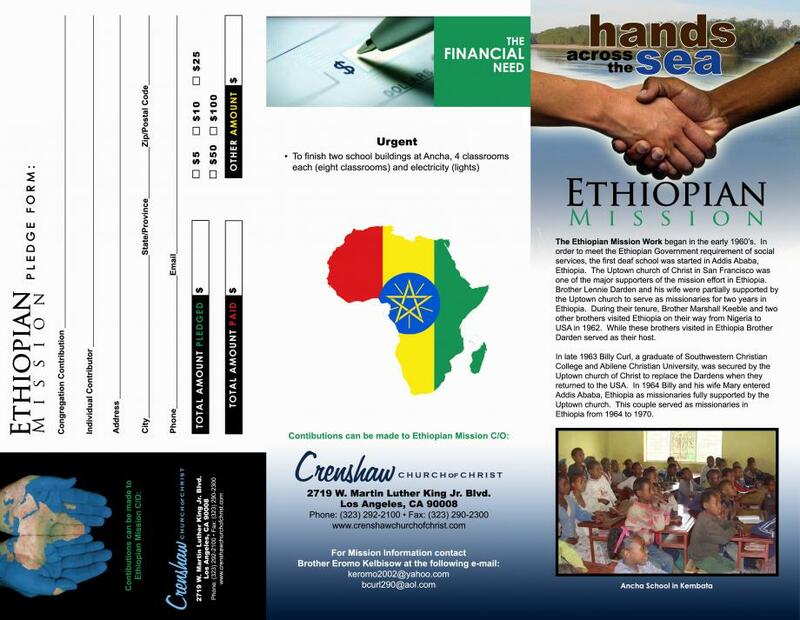 Ethiopian Mission Newsletter will be published at least quarterly by the Crenshaw church of Christ in Los Angeles.